I think offering up a boozy treat on Fridays should be a tradition. Last week it was Apple Cider Sangria. This week I put like half a bottle of rum into some cupcakes. I mean, the week is long. I think I would like to take a break except I keep acquiring little creatures to take care of. There is Norma Jean, who is actually the most low maintenance out of everyone except for the fact that she steals my water glass at least once a day. Little Lucy Girl has a major breakdown every time I leave the house. She is a freaker-outer. Gidget thinks she needs to sleep right in my face every night and while she’s really cute and snuggly, it kind of keeps me awake. In the last week or so though, my really [un]cool neighbors seem to have acquired some more pets they can’t take care of. One kitty and two more kittens that have figured out I’m a super nice bleeding heart so while I’m sitting here working they climb up on my chairs out on the porch and peek in the window at me. Nothing like three little kitty faces peeking in your windows to distract you. And of course I feed them. And of course Lucy does back flips and acts like she has never ever seen a cat before whenever we go outside. It’s all very exciting. 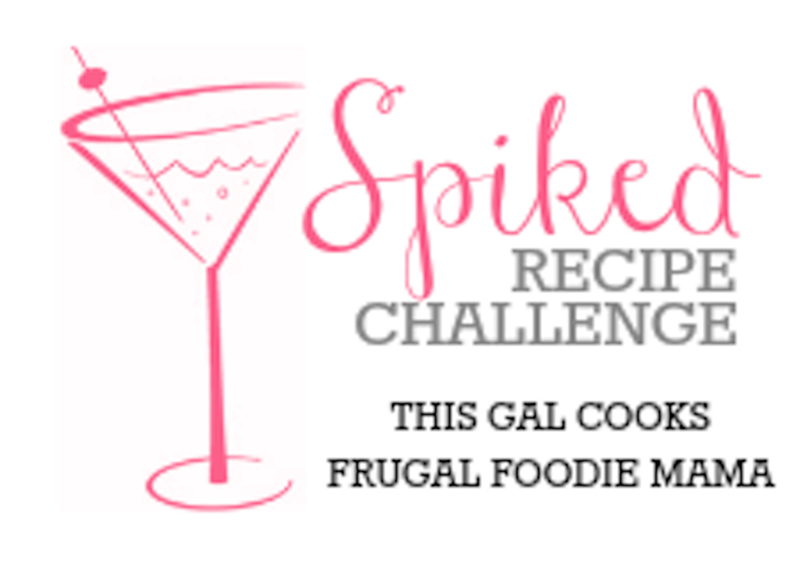 Also exciting: This month’s Spiked Recipe Challenge! These cupcakes are my entry. I should win, right? Just agree. 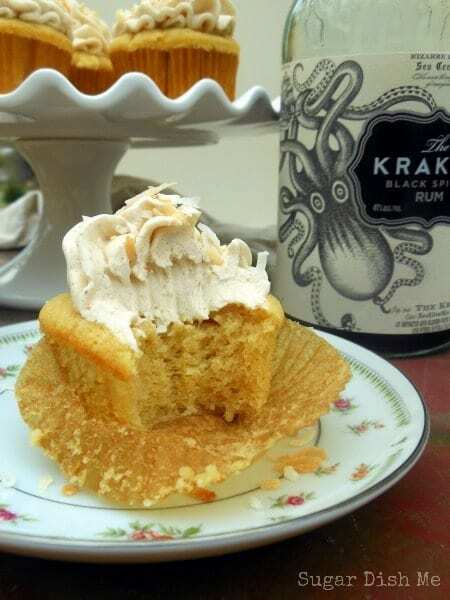 These soft little buttery cupcakes are loaded with spiced rum — The Kracken Black Spiced Rum to be specific. I am totally seduced by cool labels. But the lady at the liquor store also recommended it for the strong spiced flavor. She was right! It’s delicious. I took it a step further and boozed up the buttercream which was a really great idea so I’ll be doing that again. Butter. Sugar. Rum. YES. Make these cupcakes and have a great weekend! Buttery soft rum cupcakes topped with sweet cinnamon boozy buttercream - a rum lover's treat! Preheat the oven to 325. Line a standard muffin pan with paper liners. In a large bowl beat the butter and sugar until fluffy. Add the 3 tablespoons of oil and beat until it's combined. Add the flour, cornstarch, baking powder, kosher salt, and instant vanilla pudding to the bowl. Beat -- the mixture will form coarse buttery crumbs. Crack the eggs into a medium bowl and whisk them lightly to break the yolks. Add the remaining ½ cup oil, milk, rum, and vanilla. Whisk to combine and then add the wet ingredients to the dry. Beat until smooth. Portion the batter into the prepared muffin cups. I use a ¼ cup measure and fill them mostly full -- about ¾ of the way. Bake for 18 - 20 minutes or until a pick inserted into the center comes out clean. Let the cupcakes cool before frosting. To make the frosting whip the butter with a whisk attachment. Add the powdered sugar a cup at a time. After 3 cups add the cinnamon and salt. Beat to combine. Add the last 2 cups of frosting and the rum. If you like a thinner frosting add more rum. (**see note**). To toast the coconut scatter the sweetened flaked across a baking sheet and place it in the preheated oven after you take out the cupcakes. It only needs 3-5 minutes max. Watch it closely and remove it as soon as some of the coconut is golden. 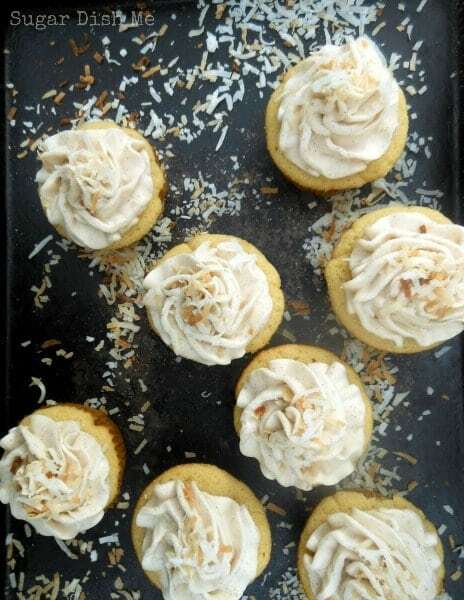 Frost the cupcakes and sprinkle each with a little toasted coconut. To pipe the buttercream as shown you'll need a little more than the recipe calls for. Increase the frosting measurements by adding another ½ cup butter, 1½ cups powdered sugar, and another tablespoon or two more of rum (to your desired consistency). You can also increase the cinnamon by adding another ½ teaspoon. Yum!! I totally bought that rum because of the picture on the label, I couldn’t resist. Those cupcakes look amazing Heather. I would vote for you, if I had a vote…sadly I don’t. 😉 Watch out, my cat used to eat cupcakes!! You are such a nice person Heather, the kitty’s just know that! And they can probably smell all the yummy food in your kitchen! I am in love with the big dollop of buttercream on top! I need that to get me going this morning! I think they do know — but mostly just that I am a sucker. 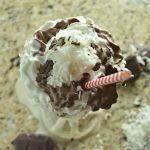 Boozy Buttercream! Yeah!!! Totally a morning thing. Yeah! I love the name you gave your frosting: boozy buttercream. That just screams of WIN! And I also love the Kraken rum that you used. Not that I have tried it but the Kraken is pretty rad. Thanks for participating in Spiked, Heather! Thanks Julie! I would highly recommend The Kraken Rum! It was darker than regular spiced rum and had tons of flavor for these cupcakes. Plus the bottle was fun which is a win in my book. Thanks for hosting the Spiked Challenge! It’s way fun! 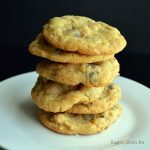 I love the idea of using spirits in baked goods. This looks scrumptious Heather! Thanks Anne!!! Spirits in baked goods are SO yummy! I would have totally bought that bottle just because of the cool label! Love it! 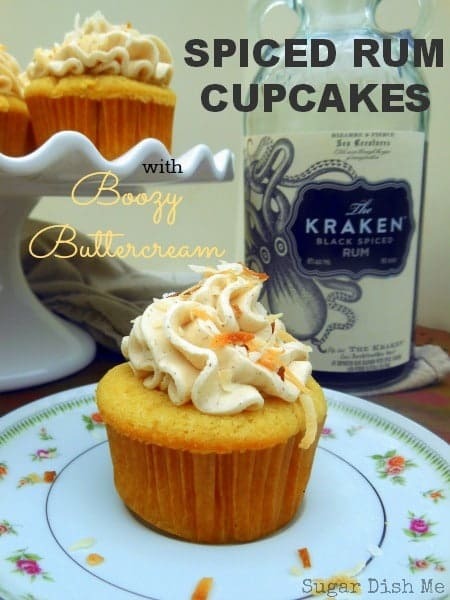 And the cupcakes look delicious – nothing better than boozy buttercream! OMGosh… I love these cupcakes! And that buttecream? Just give me a spoon & a bowl of that! 😉 lol! Thank you so much for joining us in this month’s Spiked! Recipe Challenge- good luck! We are usually loyal to the Captain BUT they have sample bottles of The Kraken at the counter — in case you need to change your husband’s mind 🙂 Thanks for hosting Carrie! I have so much fun with this!!! ooo I’m holding a super bowl /game night on sunday with a couple of my girls. I will try and make it this week to try. I’m excited, I will make a post about it. Thanks Karina! These are maybe my favorite cupcakes I’ve made in quite awhile! Enjoy and let me know how you like them! I love this recipe, but I have one question. In the recipe, the oil ingredient is listed as divided but I don’t see anywhere in the recipe where oil is used except in step 2. Can you clarify? Should all that oil be used in that step? Thanks! Hi Cassie! So sorry! It was a typo on my part. 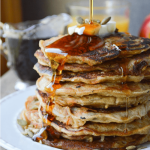 I have adjusted the instructions in the recipe card but to answer your question, 3 tablespoons of the oil are added with the sugar and 1/2 cup is added with the eggs. Thanks for catching that! Let me know how they turn out! Hi Priscilla! So sorry! It was a typo on my part. I adjusted the instructions. 3 tablespoons of the oil are added with the sugar and the 1/2 cup is added with the eggs. Hope that helps! Thanks! Have you thought of making caramel rum frosting for those cupcakes. I too used Brown eyed baker’s cake recipie with the DIY vanilla pudding. It is soo yummy. Next time I will try adding homemade caramel to the frosting. I was out of vanilla pudding mix so I added butterscotch. Everyone LOVED them. Such good cupcakes and the frosting is dynamite! Butterscotch sounds awesome! Thanks so much for the feedback Ashley! Glad you enjoyed them! And yes — that frosting is majorly dangerous. These are the most amazing cupcakes I’ve ever had!!! They were a hit when I took them to a party! Oh great! So glad you enjoyed them! Thanks so much for letting me know! I made these for my husband and his 50 Marines. They loved them! My husband said they were all gone and he had to regulate how many people got. Requested I make them again soon. Thank you. Oh that’s great!!! So glad they were a hit. Thanks for the feedback Lindsay! I made this recipe. It makes 2-3 dozen. I used regular rum and added spices. We gave these as end-of-the-year gifts. Everyone said they were the best cupcakes ever! Thanks so much for this wonderful recipe. I will continue to use it for years to come! 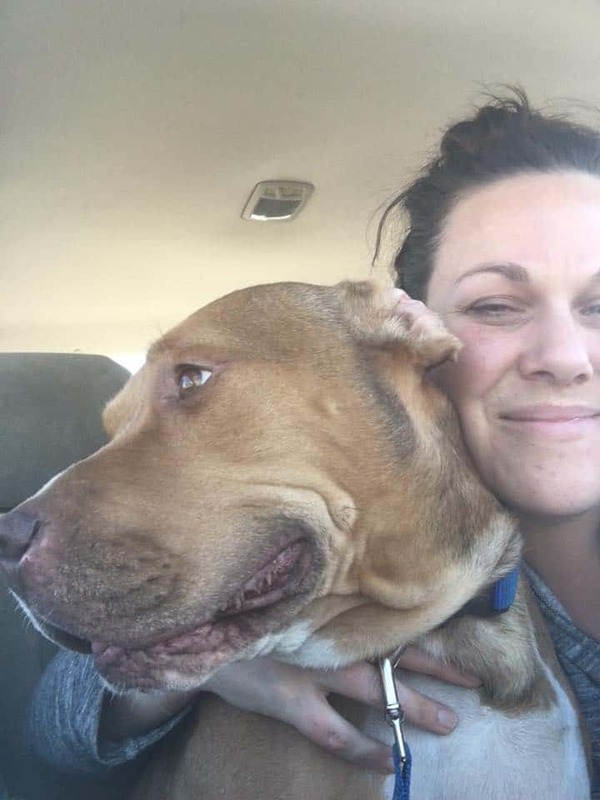 That’s so great to hear Dana! So glad you liked them! Thanks for reading! Which pipe tip did you use for the frosting? Never iced a cake in my life, but would love for my cupcakes to look like yours. These look so amazing. I am making them for a retirement party coming up. Have you ever made them in advance? And, if so, did they hold up well in the fridge overnight? Thanks in advance for any advice you can offer. Hi Ashley! They are perfect overnight in the fridge! No worries and enjoy! 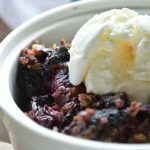 This remains one of my all-time most popular recipes! Amazing cupcakes!! So yummy! One of my favorite now! Hi Karen! I love your workplace! Sounds like fun. 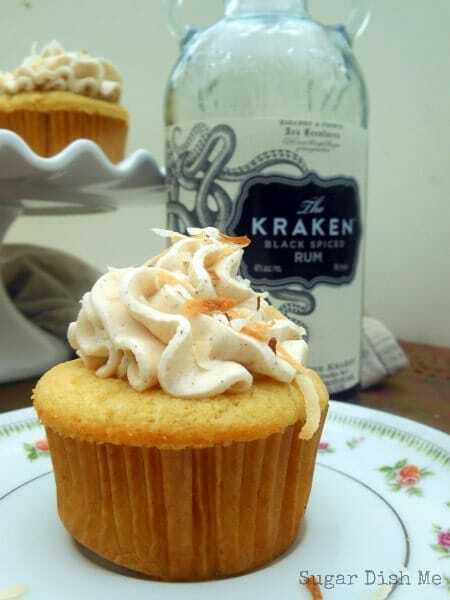 Have you ever used a misting bottle to spray your cupcakes with rum before icing? I’m getting ready to do just that and fingers crossed it works!